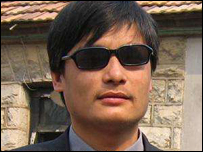 "Chen Guan gchen continued imprisonment is a blot on China's reputation. It has taken a blind man to see what the re st of the world has so call ously ignored – a policy which has violated the rights of vast numbers of women, shown no regard to the sanctity of life, and is having devastating social consequences. We u rge the Chinese authorities to release Chen immediately." Press Note for immediate release: February 14th 2009. On February 2nd 2009, in Beijing, Lord Alton of Liverpool and Baroness Cox of Queensbury met with human rights lawyers acting on behalf of Chen Guangcheng, the blind bare-foot lawyer who was given a four year prison sentence after exposing the excesses of China's one child policy. The Parliamentarians have documented concerns about Chen's current well being in a letter Dr Shen Yongxiang, Special Representative on Human Rights Affairs at China's Ministry of Foreign Affairs in Beijing. In the letter, they enclosed a recent Parliamentary reply from the Minister of State at the Foreign and Commonwealth Office, Lord (Mark) Malloch-Brown, in which he confirmed that Chen's case was recently raised at the British-Chinese Human Rights Dialogue. Dr. Shen was China's representative at the talks, held in January 2009. Lord Alton also met Dr. Shen in London and conveyed deep concern about Chen's continued incarceration and deteriorating health. In their letter, Lord Alton and Lady Cox called for clemency and mercy, specifically requesting hospital treatment and an early release. During their meeting in Beijing with Chen's lawyers, they were told that he was imprisoned in March 2006, with a prison sentence of 4 years and 3 months, after challenging the one-child policy in the Shandong Province. Chen had exposed the results of this policy: 120,000 women were forcibly aborted or sterilised in the course of one year in Shandong. The Chinese authorities have exorcised all mention of Chen from internet sites such as the Chinese Google. When Chen's lawyer, Li Fangping, travelled to Lin Yi District, Yinan County, of Shandong Province, he was assaulted & severely beaten. His colleagues told the British Peers that Li "was bleeding from the head & almost died. Speaking about his case carries great risks." His defence lawyer has been prohibited from visiting his client; he was only able visit once, in April 2008. They say that Chen has been denied his right under Chinese law to be medically examined. Chen's wife, Yuan Weijing, has only been permitted one visit to her husband – in November 2008. In a telephone conversation, via her lawyers, she told the Peers that her husband's health had now badly deteriorated, that her home is under heavy surveillance by at least eight police officers at any one time, and that she has faced intimidation. No one is allowed to visit her. Mrs.Yuan says she feels "helpless but peaceful." Chen shares a cell with seven or eight other prisoners and they have been told not to communicate with him. He has a diet which consists mainly of bread and water, and sometimes a few vegetables. His lawyers said that Chen is "very strong in his resolve and will never give up. He knows that what he has said is true. The authorities told him they would release him if he gave up and recanted his previous statements." He has refused to do this. The lawyers protested that evidence they had presented at the first hearing had been dismissed without due consideration; that the judge had taken no heed of their case; that there was no hope of an appeal. They described the attitude of the Governor of Yinan County as 'evil' although they were careful to distinguish between corrupt local officials and the central authorities in Beijing. Lord Alton and Lady Cox said that "Chen Guangchen continued imprisonment is a blot on China's reputation. It has taken a blind man to see what the rest of the world has so callously ignored – a policy which has violated the rights of vast numbers of women, shown no regard to the sanctity of life, and is having devastating social consequences. We urge the Chinese authorities to release Chen immediately."